The 2017 pennant chase is heating up and TDS TV® is your home for all of baseball. Post season starts NOW—and if you’re an Expanded or Expanded Plus TDS TV subscriber, you can watch it all. And, viewer alert: a few of the games can only be viewed on MLB Network (channels 605 SD and 1605 HD). Enjoy the magic of playing in October as these games include live coverage before and after every postseason game and analysts from some of baseball’s best. 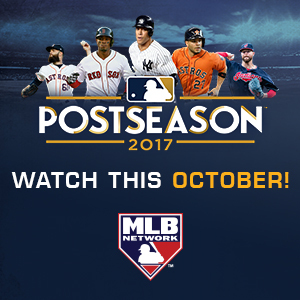 Major League Baseball’s 2017 Wild Card games are scheduled on Tuesday, Oct. 3 and Wednesday, Oct. 4. The Division Series is scheduled to begin on Thursday, Oct. 5. On Tuesday, Oct. 3, the Minnesota Twins will play the New York Yankees in New York. The game will start at 8 p.m., ET, on ESPN. On Wednesday, Oct. 4, the Colorado Rockies will play the Arizona Diamondbacks in Arizona at 8 p.m., ET, on TBS. On Thursday, the schedule gets a little more complicated. We know who is playing, but we’re waiting to hear exactly where you can watch. The MLB Network will have exclusive coverage of some American League Division Series (ALDS) games—but the schedule for those hasn’t yet been determined. Keep a watch on the MLB schedule here so you know when and where to tune in.